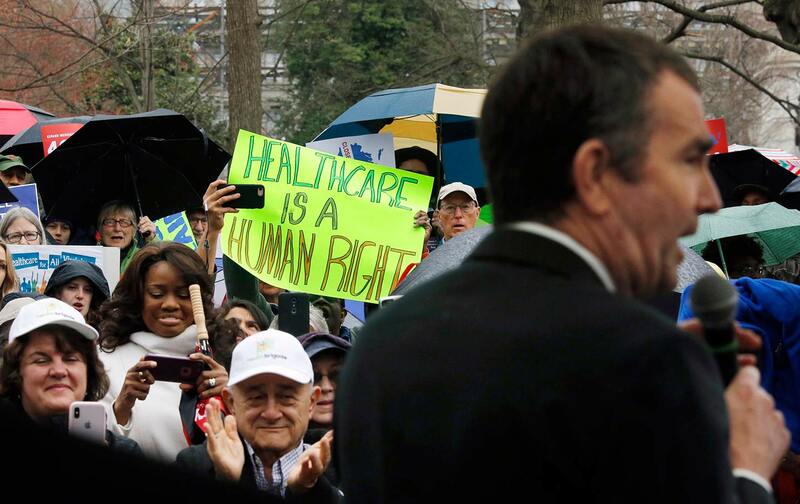 Ralph Northam won the Virginia governor’s mansion last year after running a campaign that strongly advocated expanding Medicaid in the state, as allowed by the Affordable Care Act. In doing so he captured 77 percent of the vote among the 39 percent of voters who considered health care to be their most important issue. The state legislature has now called a special session to debate that expansion, and on Tuesday night the House of Delegates passed a budget that would expand Medicaid. But the State Senate has rejected a similar bill once already this year, and may do so again. While the issue remains deeply divisive among Virginia’s legislators, the same cannot be said for Virginians themselves. 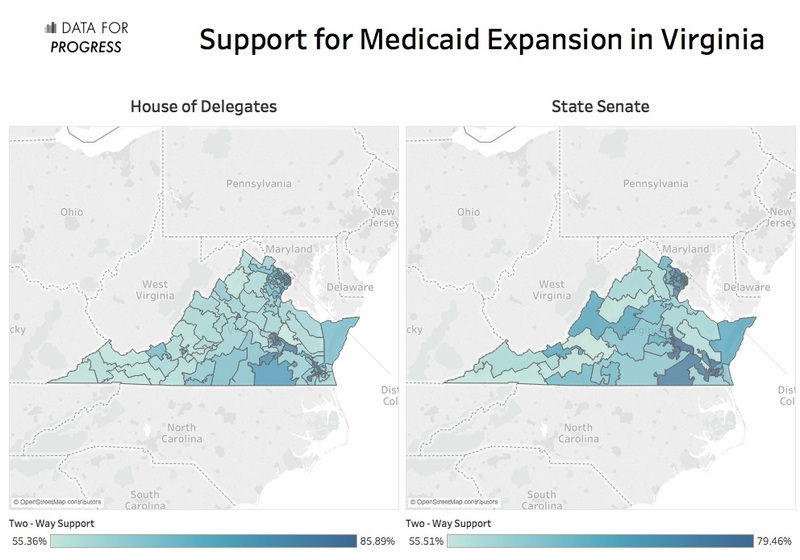 According to new data from Civis Analytics, presented in a new Indivisible and Data for Progress memo, Medicaid expansion has majority two-way support in every Virginia state legislative district in the state. Two-way support means people who responded “don’t know” were excluded, indicating that people who know about the issue and would be more likely to vote on it are overwhelmingly supportive. The results were unequivocal: Medicaid expansion is enormously popular across all districts. In every House of Delegates and State Senate district in Virginia, likely voters support Medicaid expansion, often by an overwhelming margin, with 66 percent and 67 percent supporting expansion in the median House of Delegates and State Senate districts respectively. Support for expansion never dipped below 55 percent in any district in Virginia, and reached as high as 85 percent in some others. This support is durable even among Republicans and within GOP-controlled districts. In the median House of Delegates district, net opposition among Trump voters is only nine points. Support for Medicaid expansion is strong even in deep Trump country. For example, in House of Delegate Districts 1 and 3—both of which Trump carried with at least 81 percent of the vote—Medicaid expansion has two-way support of 56 percent among likely 2018 voters. But despite these high levels of support, the result of the upcoming special session is unclear; two Republican senators who voted against expansion earlier this year reportedly will “consider” changing their vote. What they would need to get there is uncertain, and before the election, Northam briefly suggested he might be open to compromising on Medicaid, eliciting a strong reaction from the base—and understandably so. For Guzman, the work that organizations like Invisible are doing could be a deciding factor. “When you have hundreds of your constituents calling, writing, e-mailing, and knocking on your door, you need to take note, because those that won’t will face the consequences in 2019 when they lose their seats.” Our analysis suggests she’s correct—politicians who refuse to accept Medicaid expansion are defying their voters and risk a backlash in 2019. Indeed, another recent analysis by Data for Progress, using the Cooperative Congressional Election Studies from 2014, found that Medicaid expansion has 50 percent support or more in every state but Wyoming. 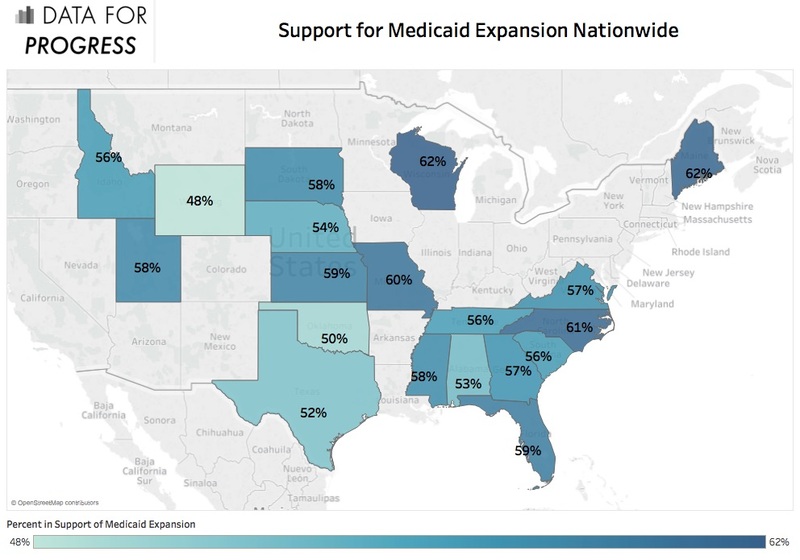 Even in deep-red states like Tennessee, Medicaid expansion elicits broad support. Democrats therefore have every political incentive to simply do the right thing. They should use Medicaid expansion as a way to put Republicans on the defensive and mobilize marginal voters who drift in and out of the electorate. There will be some hurdles: One of the reasons for the disconnect between the popularity of Medicaid expansion and its lagged implementation in states under GOP control is voter disenfranchisement; Republicans deny affordable health care to the same constituents whose right to vote they have actively suppressed. But another key roadblock might be that state legislators believe that their voters are more conservative than they are in reality. This is why this polling analysis is so important. 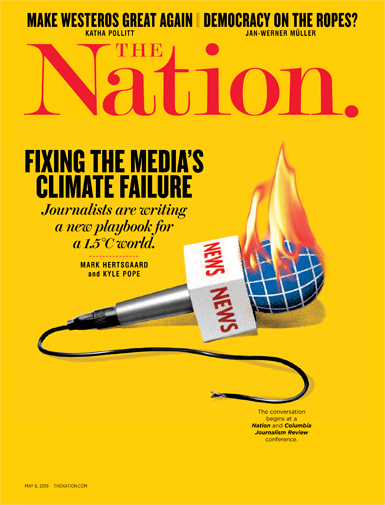 And these battles are winnable: Last year, over the loud objections of Governor Paul LePage, Maine residents voted to expand Medicaid, and there are efforts to get similar initiatives on the 2018 ballot in Idaho, Utah, and Nebraska. In Florida, Gwen Graham has made outgoing Governor Rick Scott’s failure to expand Medicaid a central campaign issue, saying she would veto all Republican legislation until they passed Medicaid expansion. Avery WendellAvery Wendell is a data scientist based in San Francisco.